With spring and planting season just around the corner, now is the time to choose a garden design for those small spaces and get started. Many of these ideas are great even if you do have big garden space but just want something a bit closer to the house. Whether you want to plant vegetables, flowers or have your own herb garden, you are sure to find a garden idea for your small space in this vast collection. You can create a beautiful garden area with some old furniture that you are planning to throw out. Old dressers make great planting bases. You simply put the plants in individual pots and then use the drawers to hold them. You end up with a three tiered garden look that is both beautiful and space saving. If you don’t have an old dresser on hand, you can probably pick one up at a yard sale or flea market for just a few dollars and then all you have to do is start planting. Recycling is a great way to save money and space. This recycled upside down garden idea is perfect for those who live in apartments or you could just hang your plants on the porch if you have one. 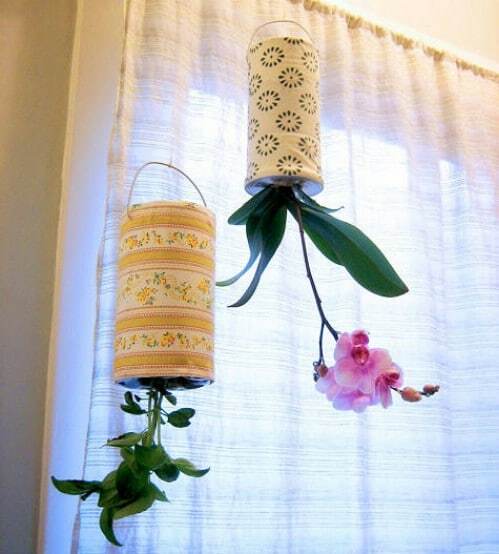 You just have to choose the containers that you want to use and then follow the instructions to properly hang your plants so that they will grow as they should. 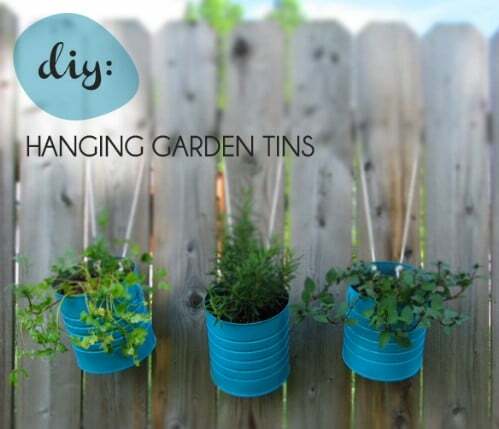 This is great for flowers, herbs or many vegetables and is space saving and a really cute way to show off those plants. A shoe organizer is a great way to build a vertical garden. Not only does this garden look great and save space, it helps to keep those critters and pets out of your herbs and vegetables. You just have to fill each of the shoe spaces with potting soil or compost and then add your plants. Be sure that you choose a place for your hanger that gets enough sunlight for the plants and if there is protection overhead from rain, you will need to water them occasionally as well. 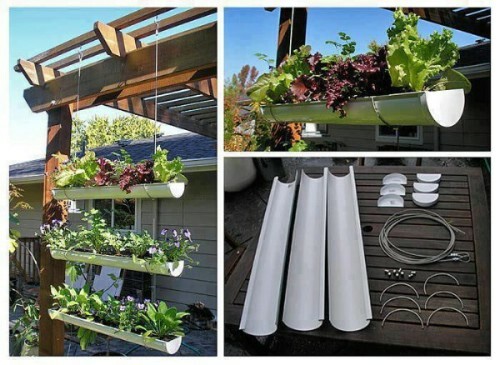 Old guttering can be used to create a beautiful hanging garden. The amount of guttering that you will need depends on the size of the garden you want to plant. 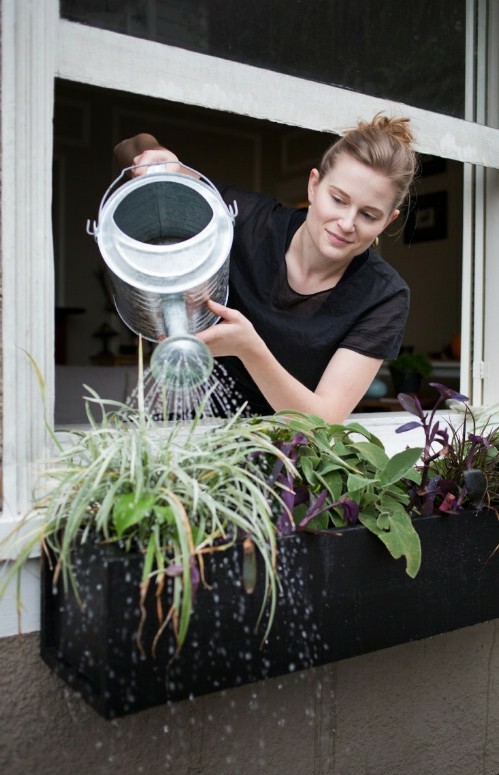 Gutter gardens allow you to take advantage of the vertical space around your yard so even if you don’t have much of a lawn, you can still grow flowers, herbs and vegetables. Just remember to choose a spot that gets a few hours of direct sunlight each day. Gutter gardens also provide a bit of a natural privacy fence or divider for your garden area. 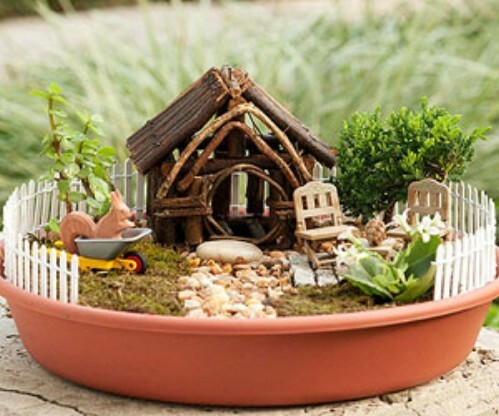 Now, you don’t necessarily have to use the fairies in this garden but the overall idea is a great one for smaller spaces. You will need a container. In this case, an old wooden barrel provides the base for the planting. Once you have a container, you just begin filling it with soil and other smaller containers. 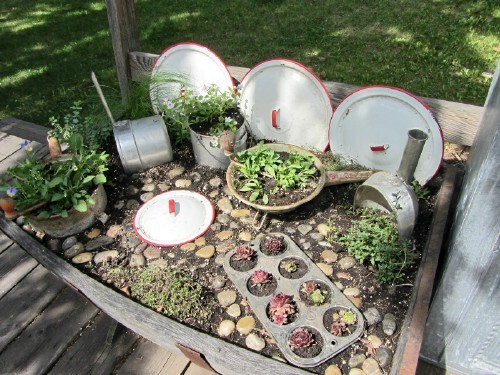 Note the muffin pan in this garden which is perfect for smaller herbs. 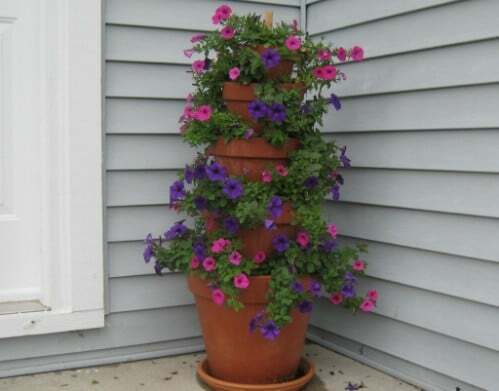 You could also use regular terra cotta pots or just about any type of container. Old pots and pans are great if you want to create the kitchen look. 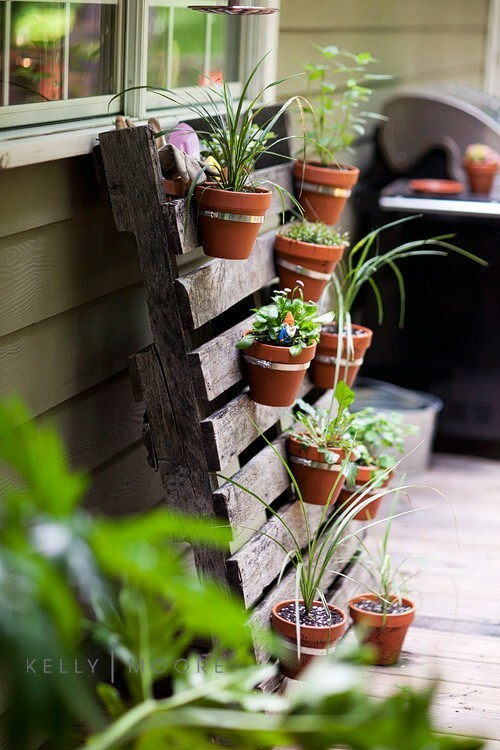 An old pallet – or several if you want – can be turned into the perfect planter for vertical gardens. Even if you have a rather large outside area, vertical planters are great because they save space and they are very attractive to look at. They can add to your current garden area and give you much more space for planting additional flowers, herbs or veggies. You just have to attach your terra cotta pots to the pallets using zip ties or something similarly strong and then choose what you want to plant. 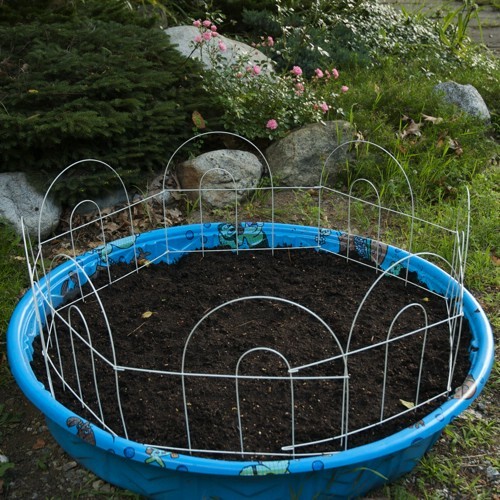 If you don’t really want to tear up your yard or you have no yard to use, an old plastic kiddie pool provides the perfect raised garden bed. If you want, you could go in and cover the pool with stones or bricks to make it a bit more attractive. You just have to fill the pool with soil or compost and then begin adding your plants. This is great because you can take up the pool during the winter if you want and then put it back when it gets close to planting season again. Container gardens are great because they are portable. If you need to move them, you can and without worrying about regrowing grass over your garden area. If you have a fence or deck, a colorful container garden is a great way to add a little beauty to the area and save space for your planting as well. 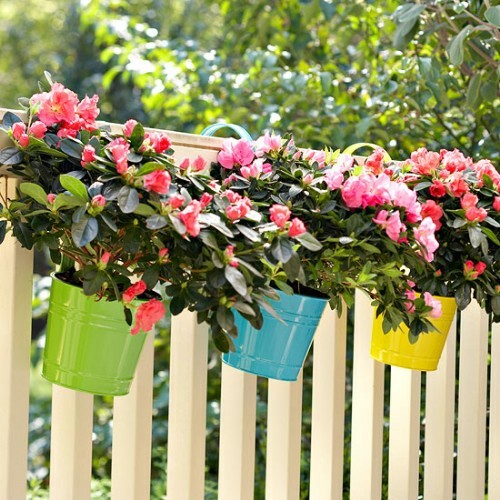 Choose colorful bucket planters and simply hang them on your fencing or you could even hang them from windowsills and other areas around the home. You can lay out your garden area and surround it with terra cotta planters to make it more defined. This is a great idea for small garden spaces because it helps you to keep your garden area separate from your lawn. You simply decide the size of the garden that you need and then outline it with terra cotta planters. You can then use the planters to add additional plants to the area. This design works perfectly for vegetable gardens but could be used for a flower garden as well. Tiered gardens are great for small spaces. If you only have minimal space for flowers or veggies, you can create a great tiered garden from a few terra cotta planters. Once stacked, you can just plant whatever you want in the planters and you have space for as many plants as you want depending on how many planters you use. You could use the plastic planters if you want but the terra cotta ones are a bit sturdier and will hold up for much longer. 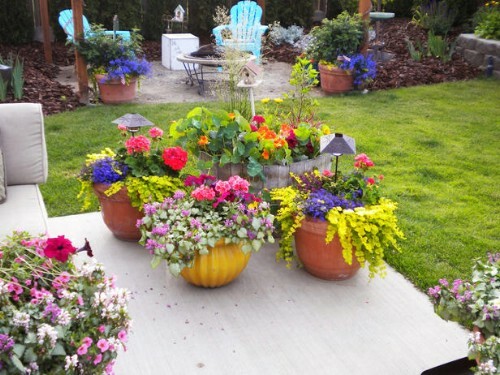 This is a great garden idea for annuals, particularly if you want something colorful on the porch. For yards that are in progress or those that have a few tree stumps in the way, you can actually use those stumps as planters. This eliminates the cost of having them completely uprooted and gives you a very unique gardening idea to boot. 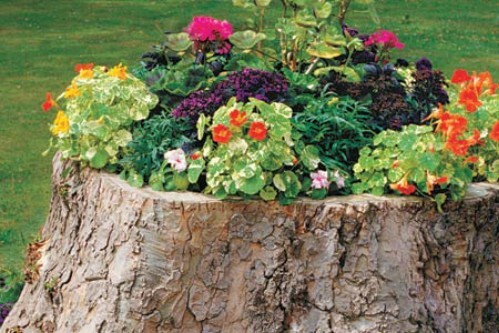 You just have to hollow out the inside of the stump just a bit so that you have room to place the planters. 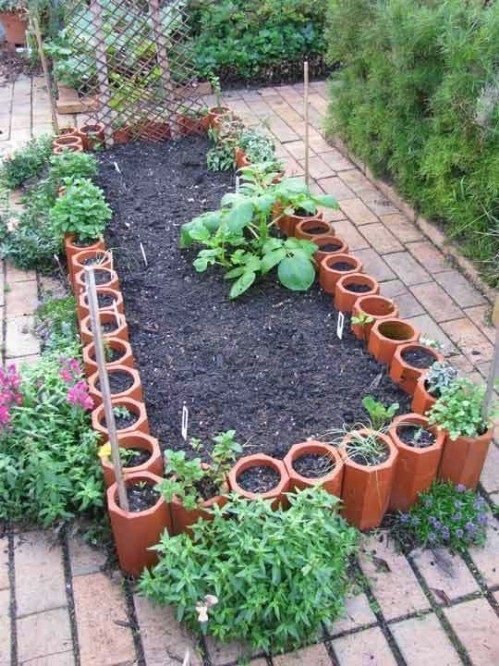 This is a great idea for flowers or you could use those stumps for herb gardens as well. Small garden spaces should not be hindered with regards to adding benches and other accessories. 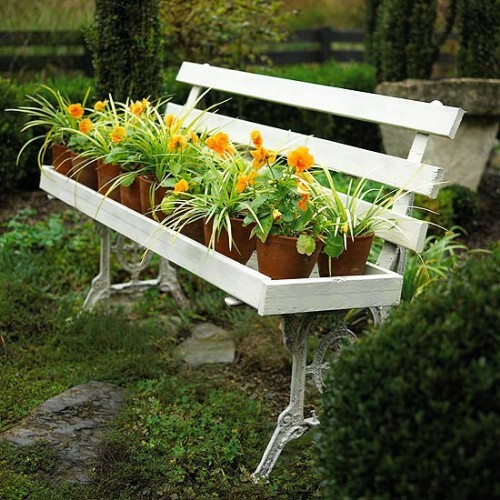 In fact, you can add a beautiful bench and then turn it into a plant holder. This is a great idea for older benches, those that you really can’t sit on any longer. Just use the seat to hold your planters or you could get really creative and use a bench that doesn’t even have a seat by simply hanging the plants or creating a raised garden from the seat area. 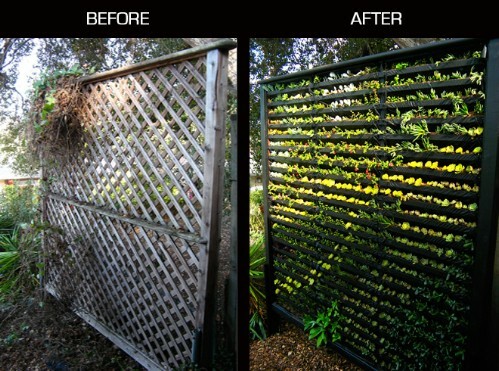 If you have a fence, you can turn that fence into a garden area by simply hanging planter boxes. 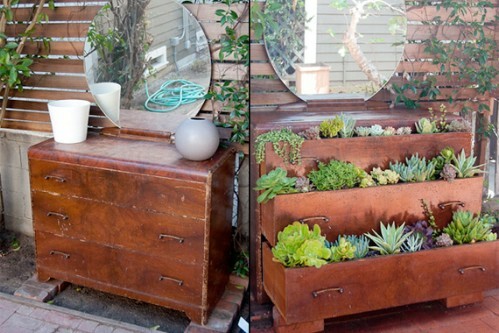 Once you have the boxes in place, you just have to add terra cotta planters with your plants inside. 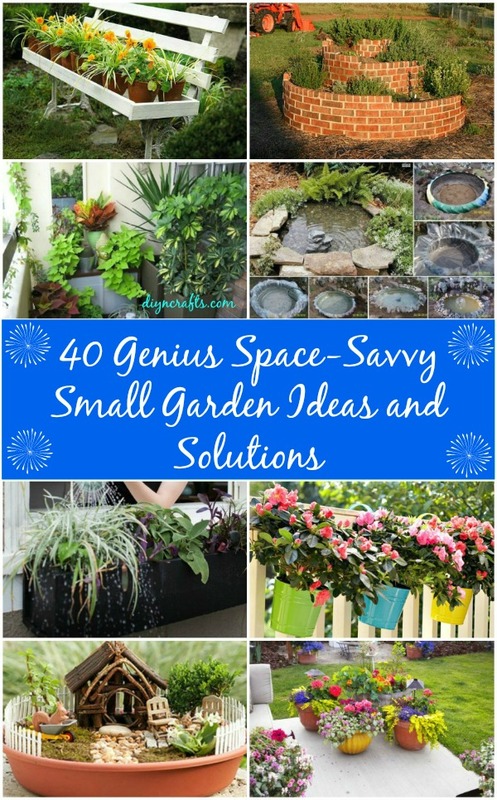 This is an excellent small garden solution for those of you who don’t really have any yard to deal with and who really want to plant fresh herbs, veggies or flowers. You can place different planters to make it more colorful and the boxes are really easy to craft from old wood pieces. 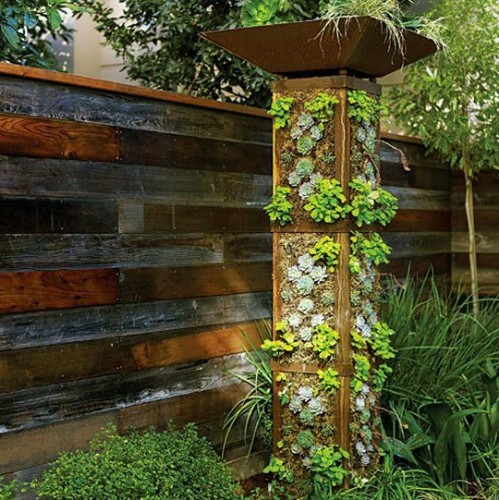 Even for the smallest garden spaces, this vertical tower is a great addition. You can build it easily and once it’s done, just add the plants that you want and they are all contained in the vertical structure. Build it taller if you want to add more plants or you could shorten it and add a couple of them to your garden area. Building it is a lot easier than it looks and you can save a bundle over buying one already done. The cost of building this tower yourself is less than $200 as opposed to more than $2,000 for a store bought one. 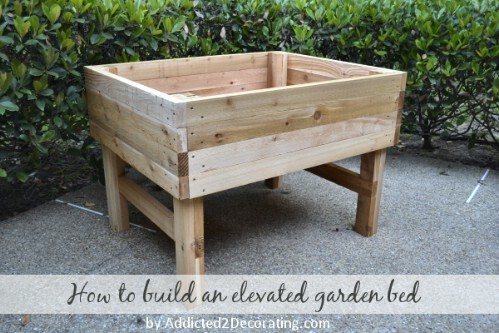 You can build elevated garden boxes and use them throughout your landscaping. These are great if you just don’t have much yard and you want to keep your garden on the deck or porch. You just build the boxes to whatever height you want. Note that while you can build them with legs, you don’t have to. Elevated garden boxes are very popular and great for decorating steps, decks and other small garden areas. 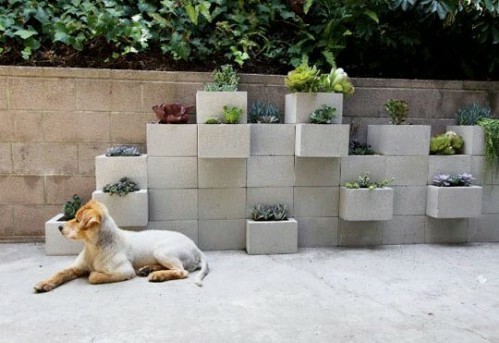 You can even build stackable boxes or do them in different sizes to add depth to your garden area. 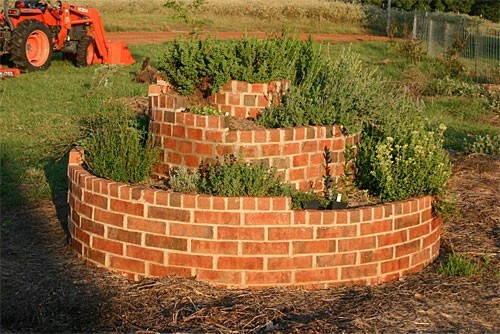 This DIY herb spiral is a must for small garden spaces. You don’t necessarily have to plant herbs in it. These work great for flowers or other plants as well. Because the spiral has high spots and low spots, it is actually a better idea for certain plants than flat gardens. Herbs like rosemary and oregano do well in higher areas so they are perfect for the top of the spiral. Plants that like more moisture and those that prefer a bit of shade do well in the bottom. Hostas for instance, can be planted in the bottom while many annuals that require more sunlight will thrive on top. 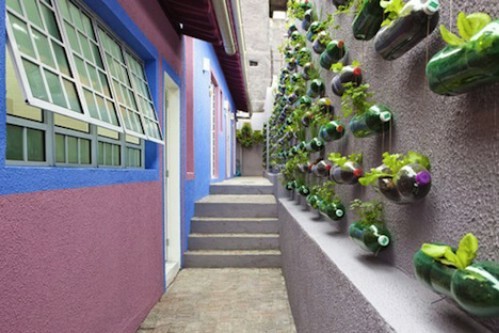 For fences, this vertical soda bottle garden is a great way to display those plants or raise those veggies. You also get the added benefit of being able to recycle those 2 liter soda bottles and put them to good use. The gist of the garden is really simple. You just cut the side out of the bottles and then use that space to plant whatever you want. This is a great idea for herb gardens. You can hang the bottles from the side of the house right outside the kitchen door so that your herbs are easy to access. 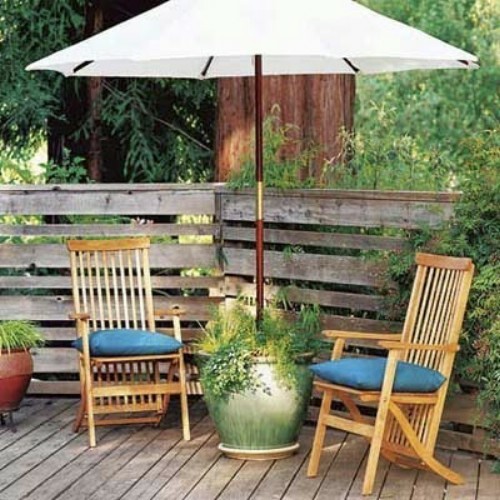 If you have a small patio and you want to incorporate a little green you can repurpose a large planter and use it as a holder for your patio umbrella. This entire project will cost you less than $20 if you already have a planter. You just need piping to hold the umbrella and you need to choose what plants or flowers you want to have next to you when you are relaxing outdoors. You could even be really creative and do this with a tiered planter so that you can add a few more plants and have a small flower garden right there beside your seats. 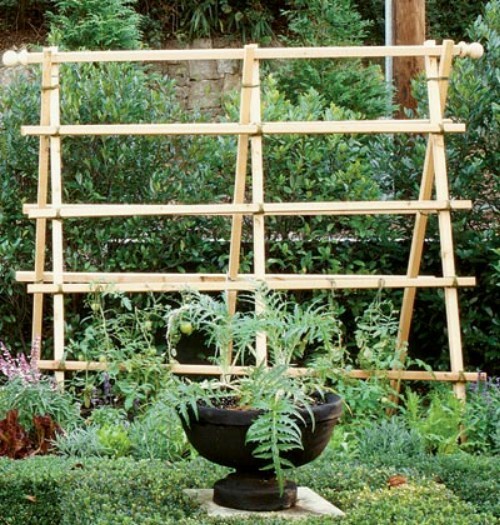 Garden trellises are perfect for smaller spaces. Even if you don’t really have the room for larger plants or vining flowers, a trellis practically makes that room for you. Building a trellis is relatively easy and is something that you can do in a weekend with a little time left over for planting. These are great for privacy as well. You can simply build the trellis next your property line and use it for a bit of privacy and relaxation. 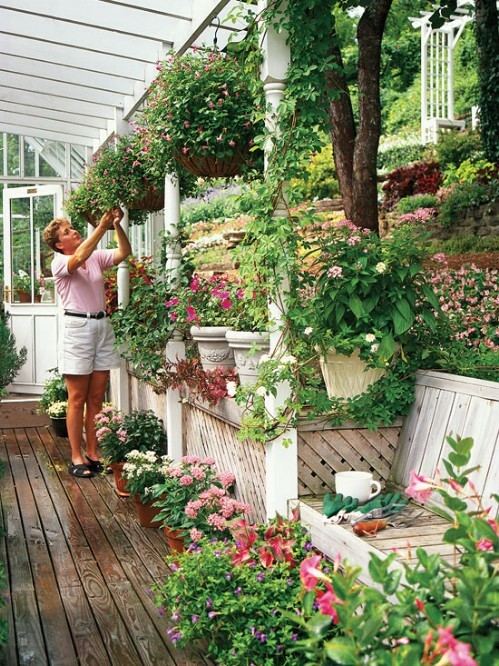 Vining plants and flowers work really well on trellises or you could simply hang loads of other plants from planters. 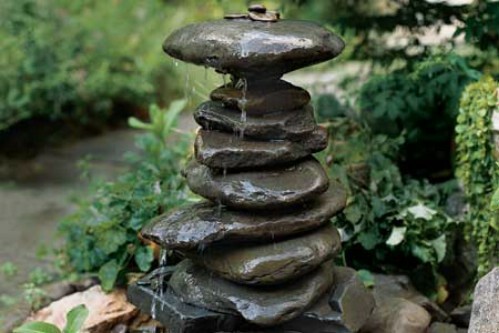 Fountains are perfect for smaller garden spaces. Not only are they relatively easy to build, they add dimension which can make even the smallest garden seem much larger. You can build a fountain out of a number of materials and depending on how you do it, you could incorporate a few plants into the design. This gives you the relaxing sound of water along with the lushness of beautiful flowers or plants. Some fountain designs may even be perfect for decks or patios for those who really don’t have much yard for planting. 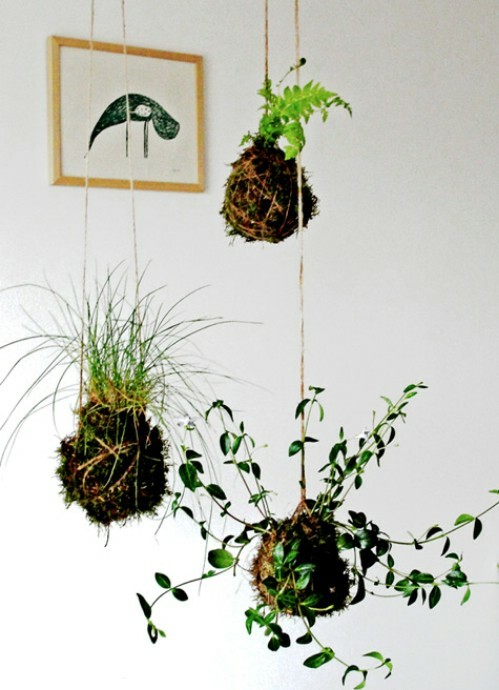 This is an adorable way to grow those plants and perfect for apartments. If you really don’t have any room for a garden or you just want to add a little uniqueness to your porch or patio, these suspended string containers are a great idea. Instead of worrying about land space you can simply utilize the space that you have above. 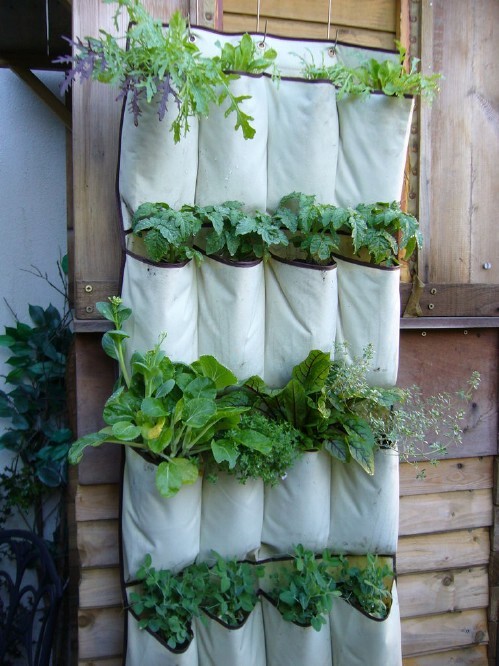 These would also work great hanging from trellises or other structures that you may have in or near your garden. If you don’t have a lot of space, you can still have a nice pathway and alongside that pathway is the perfect place for gardening. Small shrubs, hostas and other leafy plants look beautiful outlining a garden path. You can create a path through your yard or a small garden using any number of materials and when you use the outline of that path for growing, you can save space and make your path look that much more beautiful. If you already have a path – to the garden or even to the sidewalk – utilize that space beside it for growing plants and flowers. Hedges give you the opportunity to define your garden space. Even in really small spaces, a few hedges can make all the difference. You simply have to outline the area that you want enclosed and then choose hedges to surround it. Be a bit creative and use those hedges to outline planting areas as well. If you are planning to build raised beds, planting hedges around them will not only outline them and make them a great focal point, it will help to add a bit of greenery to your outdoor living spaces as well. You don’t have to spend a small fortune on a pond to add the serenity of water to your garden space. 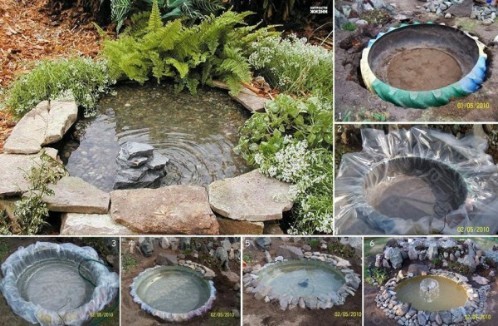 You can create one yourself using an old tire and the great thing is that you can use tires of any size so no matter how much space you have available, you can have a yard pond. Add a few flowers or green leafy plants beside it and you have a wonderful oasis that is sure to relax you after a hard day at work. With cinder blocks, you can create a beautiful garden wall that holds numerous plants and gives you a bit of privacy as well. This is perfect for smaller yards and can be built right next to the fence. 12 inch cinder blocks work well for this project and you can secure them together with liquid nails. You can toggle the blocks however you want to create different planting areas and to make the entire unit unique. This is great for greenery as well as flowers and will certainly be a conversation starter when guests enter your garden area. Even small spaces can be turned into beautiful beach areas – even if you live in the center of the nation. You don’t have to be near the beach to relax like you are. 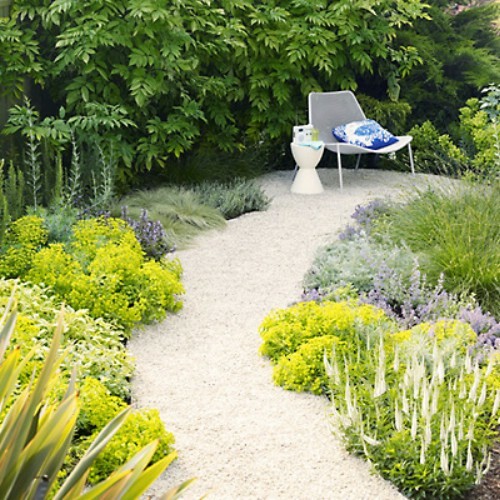 This beach garden area can be easily built and takes up very little space. 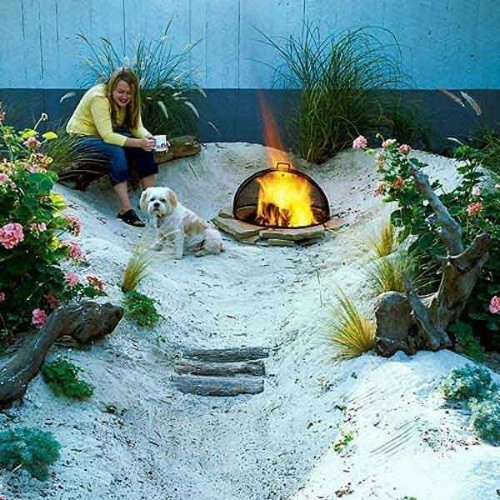 You just have to choose the type of fire pit that you want and select plants that will grow well in your area and look like something that you would find on the beach. The sand is a great cover for problem areas so if you have less-than-perfect grass cover, this is an excellent idea for your landscaping. 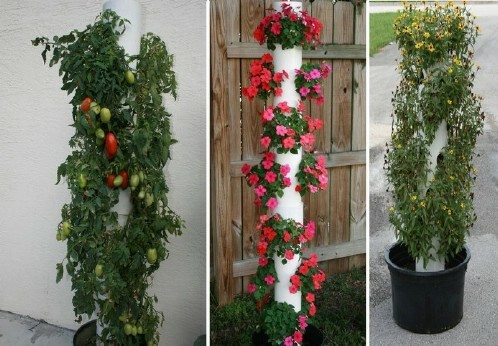 If you want to grow your plants on the patio, why not make them all vertical? You can easily create vertical planters that will help to add greenery to your patio. These planters are perfect for those who have no yard so if your only outdoor area is a balcony, you can still have loads of greenery, flowers and even veggies when you plant them vertically. If you want a lot of cover, choose plants that will vine upwards from the planters and sit them next to your home’s exterior. 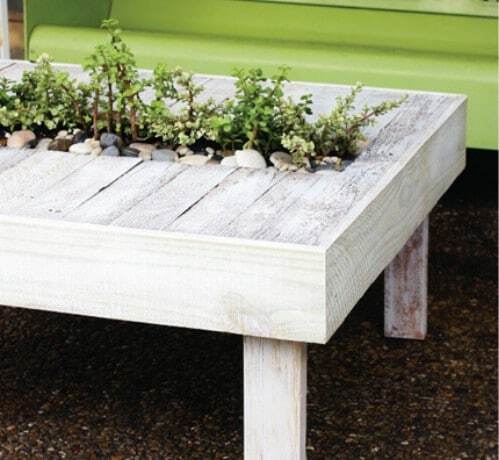 This pallet table is great and serves a dual purpose. Not only is it perfect for those outdoor get-togethers, it also serves as a planter. You just have to build the table and allow room in the center for your plants. If you are trying to decide between outdoor furniture and plants, you can just have both. The table is really easy to build and you can create a beautiful water garden in the center or fill it with soil and have small annual flowers or greenery growing there throughout the warmer months. 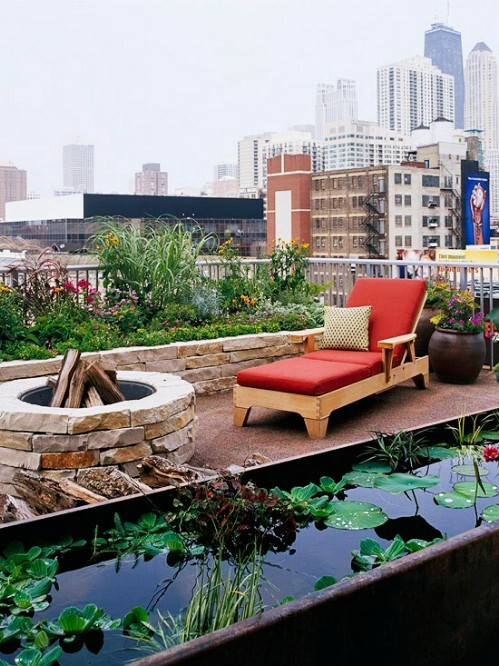 If all you have is a balcony or a small deck, you can still create a lush garden area that will be perfect for relaxing during the warmer months. Contrary to popular opinion, you can use full, mature plants for your balcony garden. 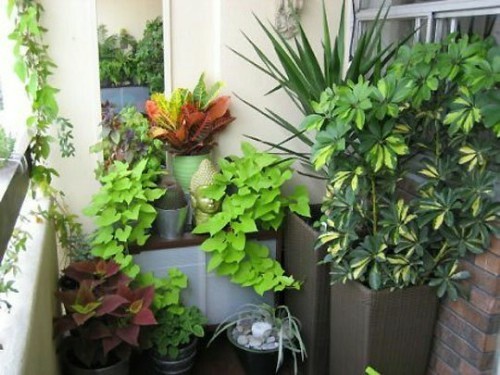 You will need to plant in containers but there is no end to the beauty that you can add to your balcony and when you mix larger plants with smaller ones, you get a beautiful garden area that actually takes up much less room than you may imagine. If your lawn slopes and you want to create a garden area to cover the slope, there are a number of plants that do well in these situations. 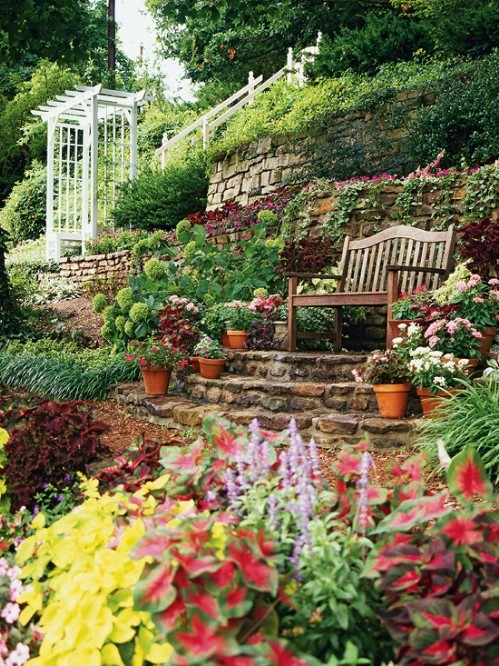 Sloping gardens are the perfect way to add greenery and beauty without actually taking up yard space. You can outline various slopes with rock, bricks or other materials and then just choose the plants that you want to add. Use taller plants on top and add shorter ones in containers at the bottom so that the entire slope is covered with greenery or flowers. If you are planting in containers, you can mix the plants in each container to make them more colorful and to give them depth. This creates the illusion of a much larger garden space while taking up very little room. Mix hanging greenery with flowers to get more beauty per square inch. There are many different plants that grow well together and look beautiful when you mix them in containers. Plus, you get to add all of the flowers and greenery that you want even if you have only a few containers to work with. For small gardens, creating fantasy accessories is the perfect way to add a little charm while taking up very little space. An old terra cotta planter, a birdbath or any number of other containers is perfect for making these little accessories which will quickly become the focal point of your garden. These work well even for balcony or deck gardens. You simply create your own little fantasy land with whatever theme or individual accessories you want and then add this to your garden area. While hanging gardens and vertical plantings are ways that you can make your small garden space seem larger, incorporating a number of planting and display techniques is even better. Layering your plants is a great way to get to put out everything you want while still saving space. Think about adding container planters with hanging and/or vertical planting to cover an entire area of your balcony, deck or a small portion of your lawn. Using various techniques together gives you much more beauty in a small space. A living wall is the perfect garden space for herbs or you could plant flowers or simple greenery. These make excellent privacy fences and give you loads of space for planting just about whatever you want. You can make them as small or as large as you need and if you don’t have the room to put the wall on the outer edge of your property, you can simply create a living wall right on the side of your home or apartment. Once the plants begin to grow in, you will have a beautiful space that looks more like artwork than it does a garden. 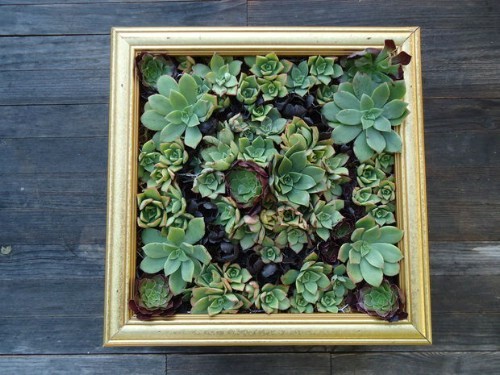 For gardening and saving space, nothing is easier than a window box. Not only does this give you additional room for growing, it adds beauty to your home. Window boxes are easy to make and you can grow everything from flowers to herbs and vegetables in them. Plant herbs outside the kitchen window and add flowers to other windows around your home. If you have no yard whatsoever for gardening, window boxes are the perfect solution to give your home a bit of greenery and to save space. 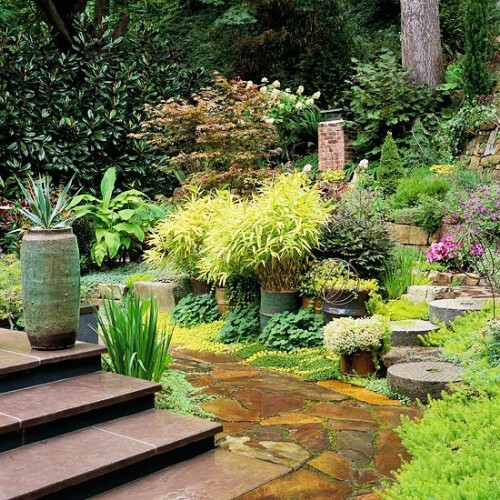 For smaller spaces, Japanese gardens are perfect because they incorporate a number of planting aspects in a small area. You can build a Japanese garden in containers or in the ground, whichever you have room for and whichever you prefer. Remember that most Japanese gardens don’t have flowers but you can add colorful plants and greenery. 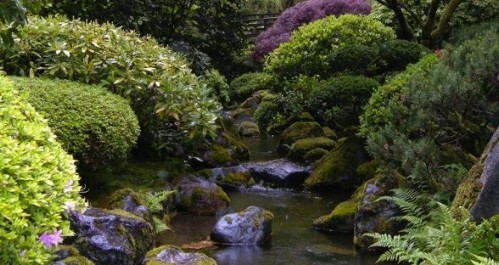 A little yard pond or a water garden is the perfect accessory for your Japanese garden. Just add a bench or a couple of chairs for relaxing and you’re all set. Succulents are beautiful and easy to care for. If you are looking for plants for your small garden space and you want something that will give you loads of color, a succulent garden is an excellent idea. You can mix these with other plants to really make it colorful or create a wall garden from the succulents. 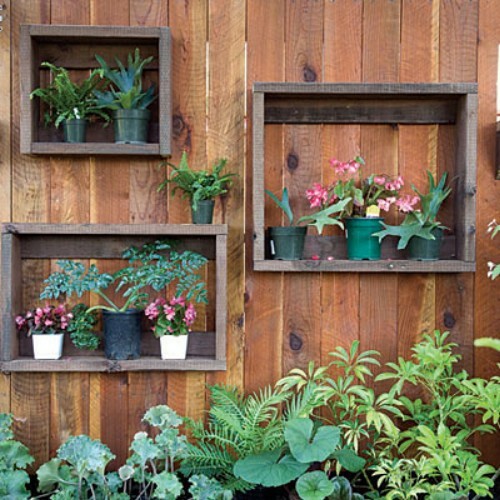 They grow very well when vertical so you can create frames and simply hang them all over the side of your home or your deck to add splashes of color that take up very little space. Even if you don’t really have the space for direct sunlight gardening, you can still create a beautiful outdoor area with shade plants. There are a number of plants that grow very well in the shade so if you don’t really have access to full sun, all is definitely not lost. Just choose plants that perform well in shaded areas and be sure to mix it up a bit. You could even add some full sunlight type plants to the mix if you plant them in containers so that you can move them to sunny areas when needed. I have recommended this system to all of my friends and family. We got good organic natural vegetables and fruits in the next harvest, one of the beautiful products in the market. Very wonderful and easy to do. Ideas does rule. The world.